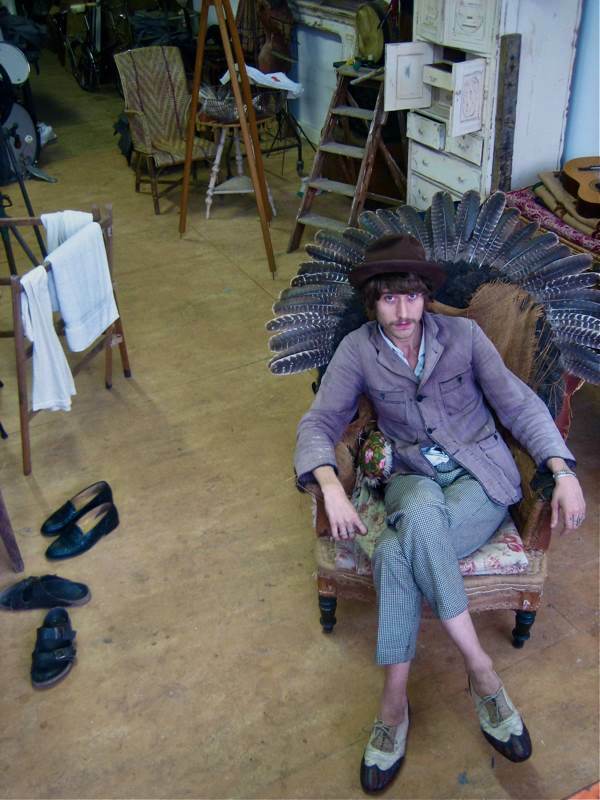 Richard & Cosmo Wise have the most beautiful collection of old clothes I have ever seen, a momentous stash filling three huge studios in the rambling building in Hackney Wick where they live and work, surrounded at every corner with piles and rails of historic apparel. 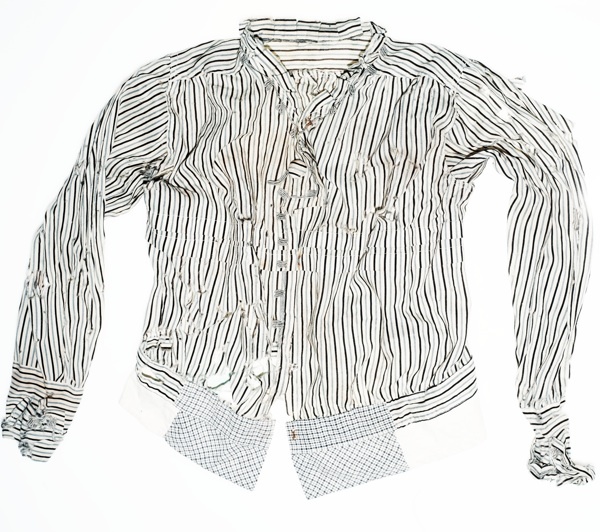 Father & son have devoted their lives to seeking specimens of extravagantly worn-out work garments – usually pre-1930 and some as old as 1880 – in rural France and Japan. These remarkable raiments, each with its story to tell, are gathered together in this afterlife for tired clothing where they can be appreciated and cared for. If only they could speak and tell their tales, what a wonderful party it would be. On my recent visit to their magical emporium of garb, Cosmo brought out some of his favourites to show me, and here you can see for yourself and learn more of the discreet appeal of these charismatic old rags. 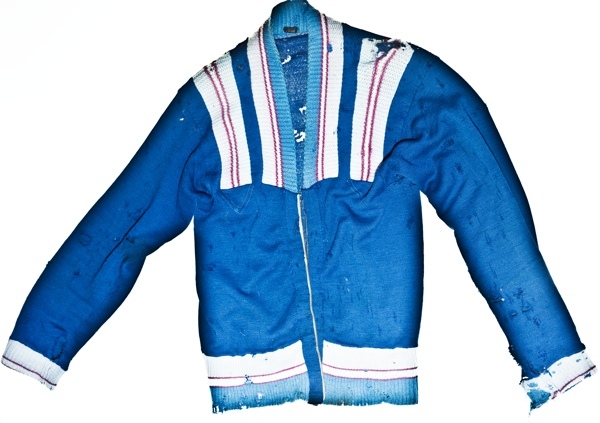 A double-breasted blue moleskin French work jacket from the late nineteenth century, still with its original metal buttons. “This is very rare thing,” explained Cosmo in awe. 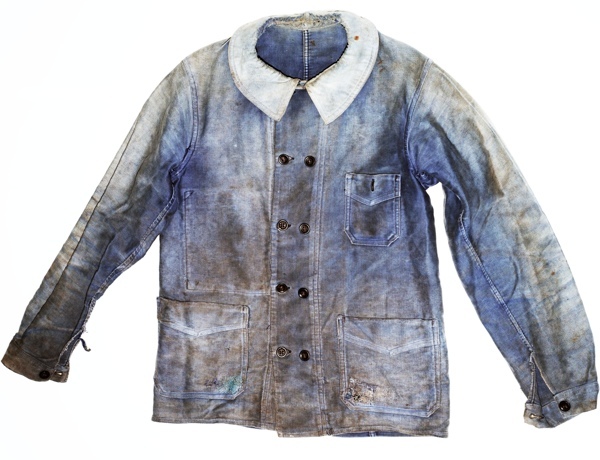 Blue jackets were for factory workers and black jackets were for agricultural workers. Reverse of the jacket above. As mass production developed through the twentieth century, the styles become boxier, and the subtleties and fit were lost. 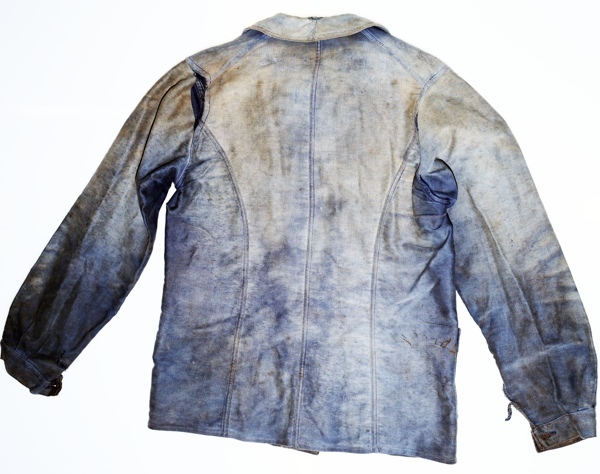 In the nineteenth century, work jackets were more tailored. The back of this one has four panels and sophisticated curved seams, which fit the jacket to the rib cage and back of the wearer. 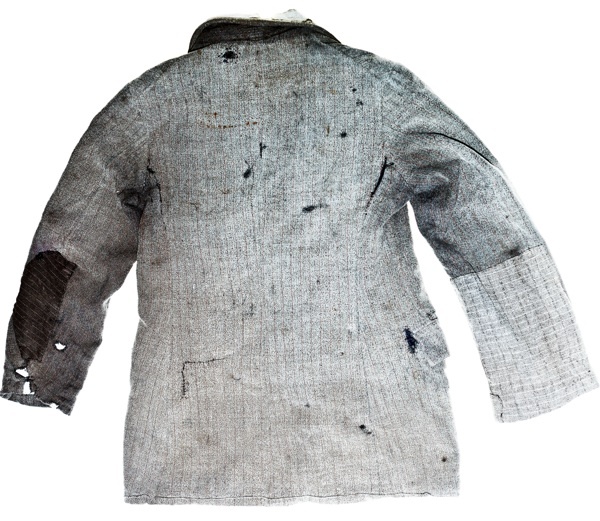 A young boy’s homemade hunting jacket of pre-1920,with four pockets, and the striped lining of mattress ticking contains a larger pocket. 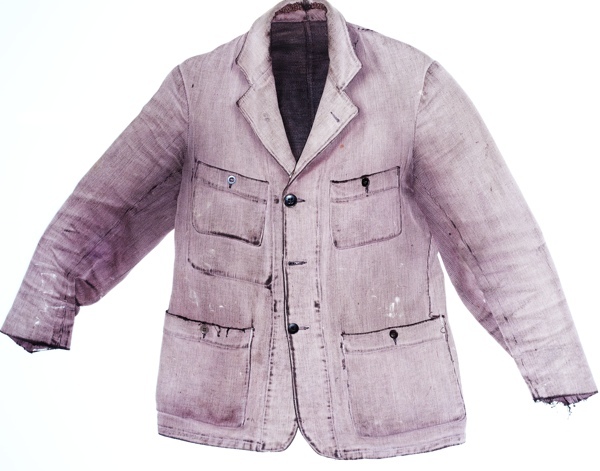 This nineteen forties jacket is a piece from the famous haul at Creve Coeur, where the largest owner of workwear in France buried his entire stock in an underground vault to hide it from tax man after the war, and it stayed there for thirty years. 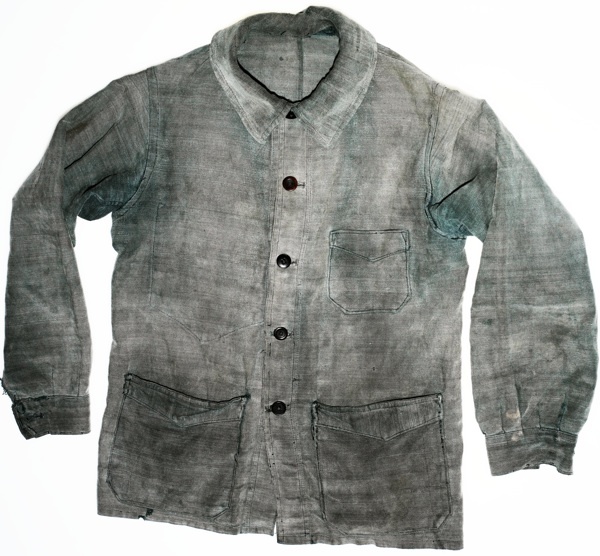 A factory made garment but of high quality fabric, and it has hessian fusing and horsehair in its structure. 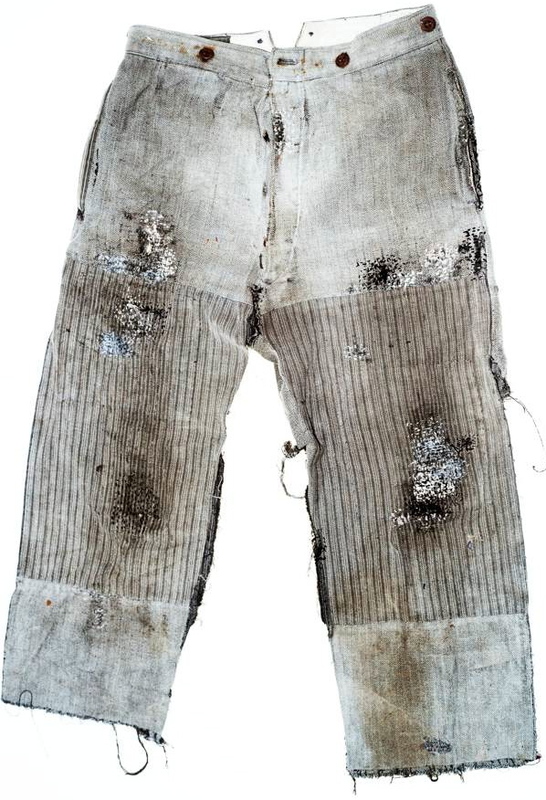 These panel-patched trousers made of old French denim were described by Cosmo as “an archetype of peasant clothing.” This high waisted pair made for a woman or a child are from the late forties/early fifties when the influence of American workwear was growing, visible in the use of Levis-style rivets and leather re-inforcing of pockets. 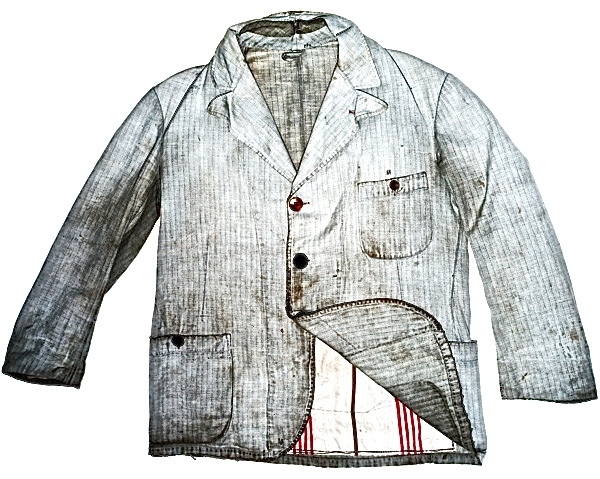 “Until the nineteen thirties, French workwear was copied all over the world, and then it changed and they all started copied America.” Cosmo informed me, with a hint of regret at the passing of European dominance in the design of utilitarian clothing. The reverse of the trousers above. The American influence is apparent in the use of zips in the pockets. 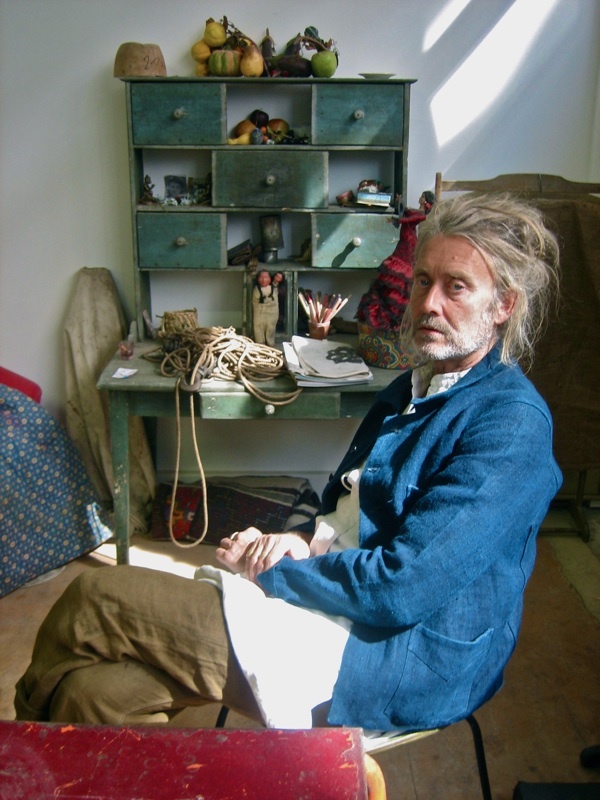 Richard Wise wears a natural indigo dyed jacket by De Rien. You can find Richard & Cosmo Wise in the Spitalfields Antiques Market every Thursday. Cosmo is also showing clothes at the Brimfield Market in Boston, USA on 6th-10th September and on 11th September at the Rosebowl in Los Angeles. You might like to read my original feature about Richard & Cosmo Wise, Rag Dealers. I love hearing about these guys …a couple of bucks as we would say in Ireland . what they do and see is magical , and takes you gentle to bring it here. Fascinating and important post . Richard Wise looks like an old style painting. Wonderful article. It makes me regret not being able to repair my own clothes beyond putting on a button or mending a simple tear. these beautiful old clothes reminded me of both japanese boro textiles (indigo farmers’ kimonos, much mended by their wives with an array of amazing japanese quilting and darning stitches, once hidden by japanese as shameful rags — “boro” — now too expensive for regular people to collect) and the gee’s bend quilts made of worn blue jeans by african american quilters in a remote community here in america (i think jane fonda discovered them) (for real). this blog post has a pic of each, for your delectation. am going to try and catch them in September at the Rose Bowl flea market. Thank you for sharing this- we need more imagination, passion and creativity such as this. 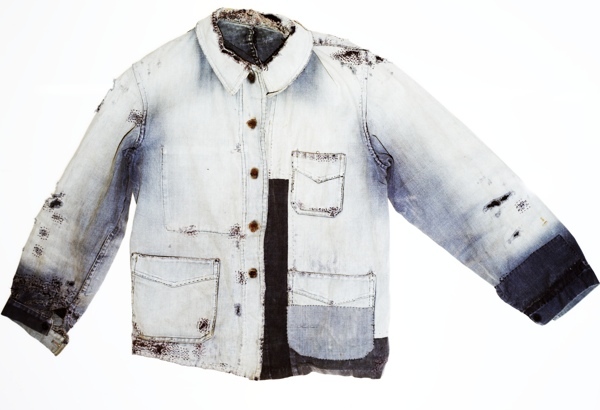 I really admire people who can breathe life into old garments or remodel them into something else. 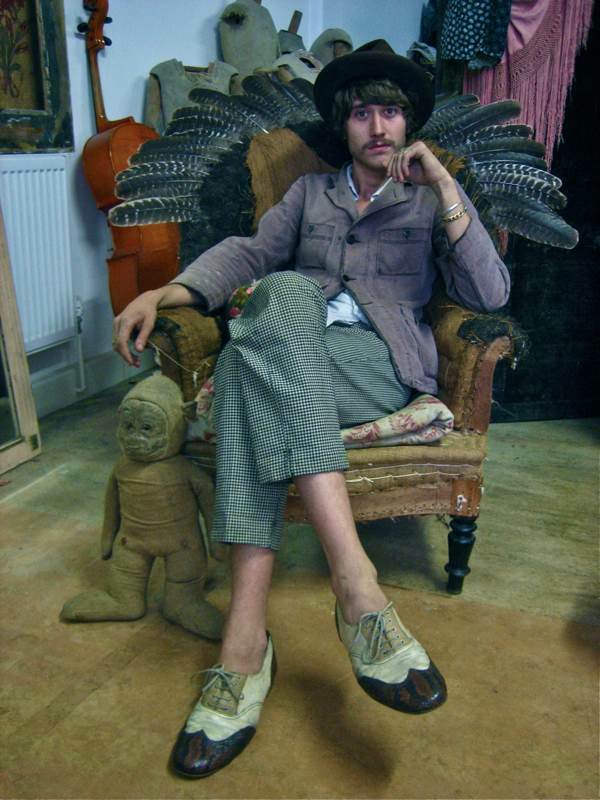 There is a guy with a shop in Edinburgh called Joey D. He takes old clothing and items that people just discard and turns them into fab new creations and accessories. 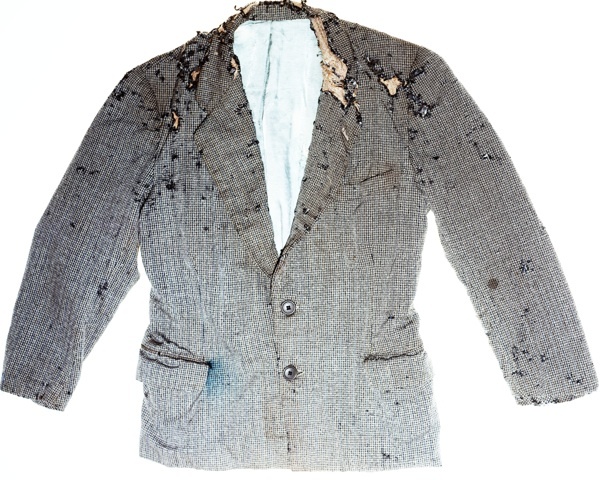 It’s interesting to imagine these old pieces of clothing, what they were worn for in their former life and also the people who would have been in them. In many cases I expect they were passed down and so the cycle would have gone on. The Wise’s look passionate about them too. i had the pleasure of meeting Cosmo in Sturbridge, Mass @ The Antique Textile Show in September. Amazing and life changing is the word on these truly remarkable textiles. Full of history mixed with sensual layers of texture…. the power of the hand, with its ability to darn, mend and recover the lost and weary. god bless cosmo. In 1978 I lived for a short while as a teenager in a semi- derelict Georgian row of houses on Lansdown Drive, London fields. The fine old buildings were squatted by a very rough crew of Irishmen, yet the residents, mostly Irish too were charged ”rent”. It was a scandal. Channel 4 once did a programme on the scam, called ”Gimme Shelter”. There was a house along the row that had been some sort of clothing maker, as bags and bags of leather offcuts, suedes and similar were left to decay in the rain that trickled down from the leaking roof. Darning is indeed a lost skill, in the days of Primark and cheap clothing..no one needs to darn now. 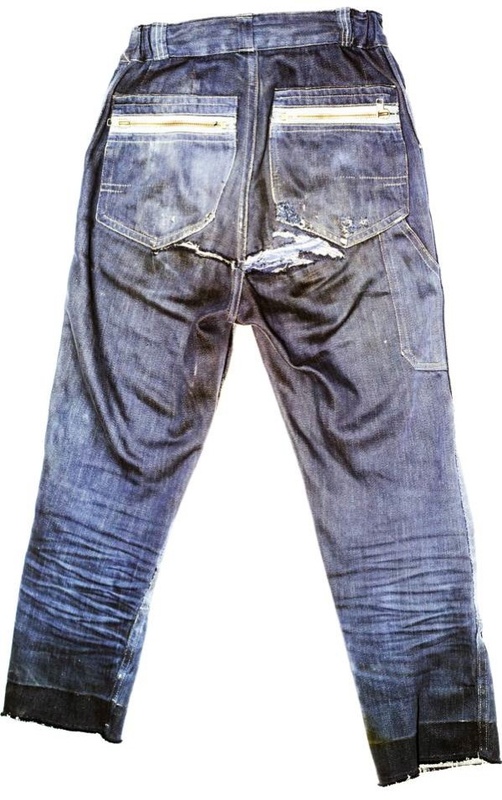 But my mum darned our woolies and patched our jeans as we wore them out, and bought jeans too big, and sewed the bottoms up so as we grew, the jeans could be ”lengthened”. 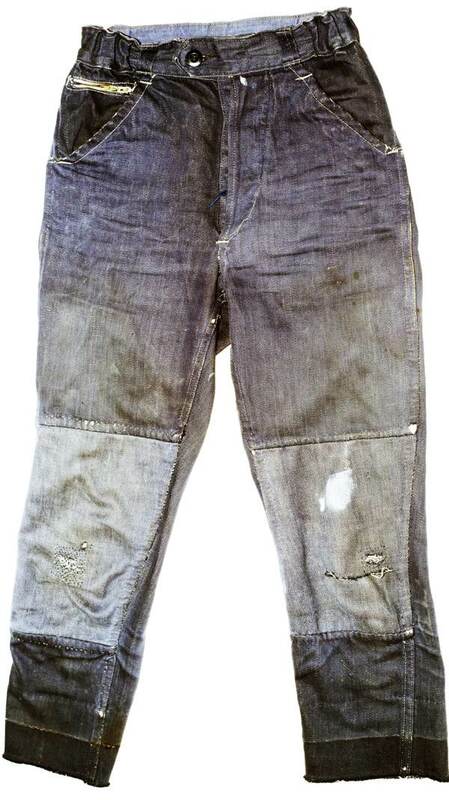 This led to ‘tidemarks’ of wear at the bottom of the jean’s legs. My parents weren’t poor, but it was the wartime generation that brought us up, with the ”waste not, want not” mentality. Even plastic bags were washed out and left to dry on the line by my grandmother for re-use. Clothing can hold the ‘vibe’ of the wearer, for certain. I looked at the derelict Georgian terrace on Google Earth recently, and they have become gentrified. Wonder what became to the residents, many of whom were elderly, in very poor health, and almost destitute.